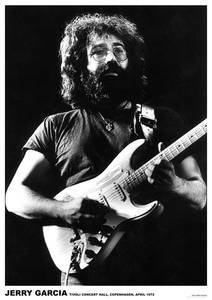 This Grateful Dead related poster is a black and white shot of Jerry Garcia playing guitar at the Tivoli Concert Hall in Denmark. A rare poster find from the vaults. Measures approximately 24" x 36", and would look great on your wall in your room or man cave.